The Consulate General of Spain in Alexandria invited Mrs. Rania Bassiouney, the coordinator of international affairs at the faculty of Languages and Translation to an art exhibition that was especially held to mark the World Refugee Day and lend some support to refugees. 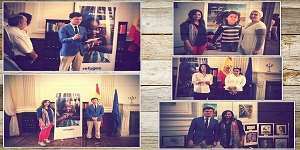 The exhibition was organized by the CARITAS Alexandria Office for Refugees, in cooperation with the Office of the United Nations High Commissioner for Refugees (UNHCR) and the Consulate General of Spain in Alexandria. This was held on Wednesday, 20th June, 2018 at the Consulate General of Spain in Alexandria. On the World Refugee Day, held every year on June 20th, the United Nations commemorates the strength, courage and perseverance of millions of refugees.